Are Democrats Really Running From Obama? Are Democrats really running from Obama in this election cycle? This last statement is almost certainly wrong. To be sure, we can quibble with how to define “overplayed” when it comes to the media’s claim that Democrats are running from Obama. But Waldman’s argument is still more than a bit disingenuous. To begin, one reason these states are “deeply red” is not because of “geography”, but because they voted against Obama in the last two presidential elections. So yes, Grimes and Pryor aren’t asking Obama to campaign with them, but that’s because he’s simply not popular in Kentucky and Arkansas. If he was, the geography would change. A better test of Waldman’s claim is to look at those “purple” states that Obama won in 2008 and 2012. Take New Hampshire, a state Obama won by a little over 5% in 2012 and by almost 10% in 2008. This year incumbent Democratic Senator Jean Shaheen is locked in a tight race with her Republican opponent Scott Brown. Given the results of the last two presidential races, you might think Shaheen has begged the President to camp out with her in New Hampshire so that she could benefit from his presence. You would be wrong. Based on the official presidential schedule listed on the White House website, Middlebury College student Tina Berger finds that Obama has not visited New Hampshire once during the last six months. The reason, of course, is that contrary to Waldman’s theme, Obama is toxic in New Hampshire. A poll from early September puts the President’s overall approval rating in New Hampshire at 38%, with his disapproval at 51%. Not surprisingly, Shaheen has worked assiduously to make the case that this election is not about the President, or his policies, but instead about what she brings home to New Hampshire. Her ads consistently tout the local projects – widening Interstate 93, opening veterans’ care facilities, reopening a local prison – that she has sponsored while in the Senate, as well as her New Hampshire roots. Her opponent Scott Brown, meanwhile, has flooded the air waves with ads, like this one below, reminding voters that Shaheen has voted with the President “99% of the time”, and taking particular care to mention her support for Obamacare. In his closing ad that has just begun airing in New Hampshire, Brown pointedly says that while Obama is not on the ballot, his policies are. Nor is New Hampshire an anomaly. In Iowa, a state Obama won in 2008 and 2012, polls show that Democratic Representative Bruce Braley and Republican state Senator Joni Ernst are in a virtual dead heat to fill the Senate seat of retiring Democrat Tom Harkin. Surely Obama’s presence on the campaign trail might swing the state to Braley? Apparently not – Berger’s data shows that Obama hasn’t visited this state in the last six months either. And no wonder – his approval ratings in a state he won twice hover in the low 40% range. And so it goes for a range of swing states; according to Berger Obama has visited Colorado, Georgia and North Carolina – states with hotly contested Senate races – only once each in the last six months, and that he has skipped Louisiana, where Democrat Mary Landrieu is in the race of her political life, entirely during that period. In contrast, he’s made 8 visits – many for fundraising purposes – to California and New York during this six-month period. Instead – like Shaheen – he touts local projects that he has helped bring to Georgia, even as he positions himself as an anti-Washington candidate. In a classic illustration of Fenno’s Paradox, Barrow runs for Congress by running against it. It is well-known that the president’s party typically loses seats in midterm elections. 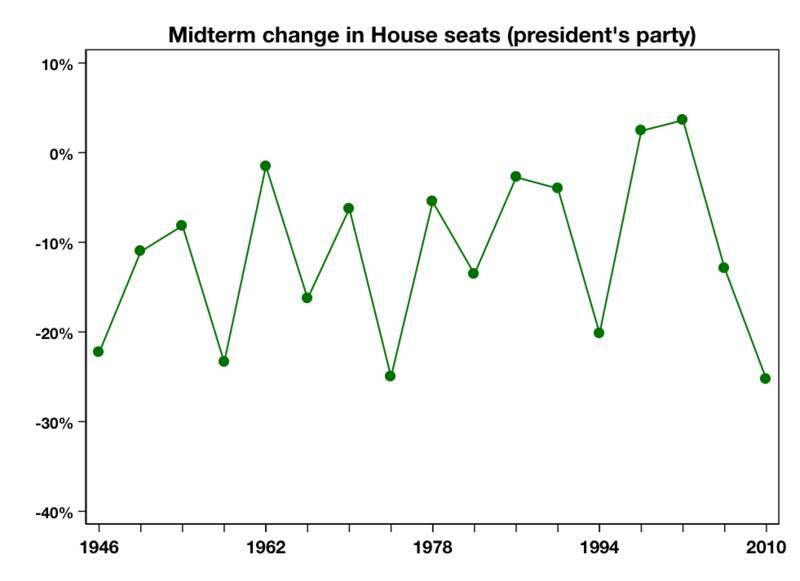 This chart shows the losses the president’s party has incurred during the post-World War II midterms. As you can see, the president’s party gained seats only twice – in 1998 and 2002 – and both those sets of elections took place during unusual circumstances (Clinton’s impeachment and post-9-11 ). As I’ve discussed previously, however, recent midterms have increasingly been driven more by national forces than they have by local ones. And in an era of ideologically-polarized political parties, that means the midterm is inevitably in part a referendum on the President who is viewed as the symbolic face of his party. Indeed, most political science midterm forecast models include a variable measuring the President’s popularity. Candidates for Congress are strategic actors. Both Republicans and Democrats understand that Obama’s policies are on the ballot this election cycle, protestation to the contrary notwithstanding. And they are behaving accordingly. In purple states, Obama’s relative lack of approval is not helping Democrats which is why they are not asking him to campaign for them. Are Democrats really running from Obama this election cycle? Yes they are.